Ottawa's RBC Bluesfest has announced its anticipated 2018 lineup. Running July 5 to 15 at LeBreton Flats, the festival will feature a bill topped by Foo Fighters, Shawn Mendes, Bryan Adams, Beck, Rae Sremmurd, Sturgill Simpson, Rise Against, Brett Eldredge and Three Days Grace. This also includes the previously announced Dave Matthews Band. Following closely behind in the initial lineup announcement are Jethro Tull, Zeds Dead, Jessie Reyez, the War on Drugs, Courtney Barnett, BROCKHAMPTON, Chromeo, Colin James, St. Paul & the Broken Bones, Shaggy, Oh Wonder, Ghostface Killah, Lighthouse, Passenger, Machine Gun Kelly, Naughty by Nature, the Strumbellas, M. Ward, Greta Van Fleet, Keys N Krates, Grandtheft, Yaeji, Hanson, Benjamin Booker, Noname, Dear Rouge, Kimbra, Kodie Shane and more. 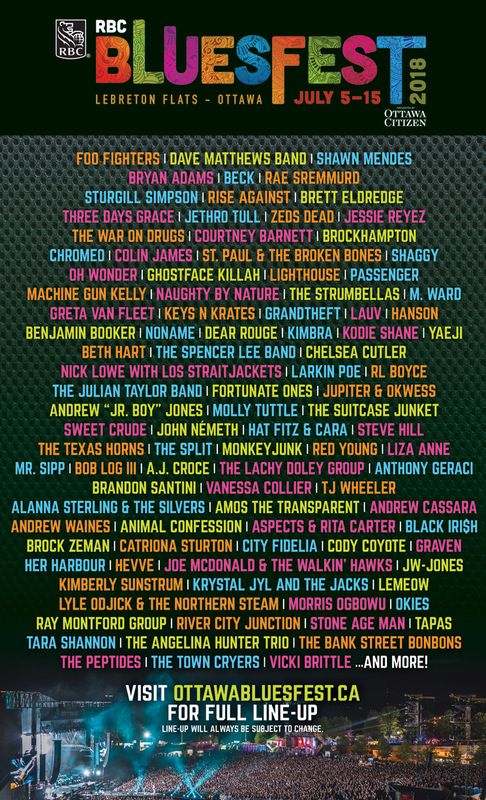 Bluesfest will be adding more acts in the weeks to come, and you can see all the currently announced acts here. "It's always challenging to put together a diverse yet compelling lineup, year in and year out, but this year we've definitely hit on some great names from a lot of different genres" festival executive and artistic director Mark Monahan said in a statement. "Since we've been stuck in quite a deep freeze this winter, I'm really looking forward to our summertime celebration of great music with the greatest music fans in the world." A one-day pre-sale will begin February 15 at 10 a.m., with an adult festival pass (25+) starting at $209 plus HST. A full-festival pass (under 25 years old) will start at $139 plus HST. All ticket types will go on sale to the general public February 16 at 10 a.m.
Further ticketing options and details can be found through the festival's official website.